An HVAC system controls much more than just temperature. 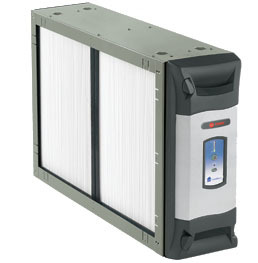 It can also improve indoor air quality in your home which leads to a higher level of comfort, cleanliness, and health. Options include humidifiers, air purifiers, and whole-house filtration systems. Poor indoor air quality can cause allergies, asthma, and other health issues according to the Environmental Protection Agency and the American Lung Association. Houses are designed to conserve energy by keeping cold air out in the winter and hot air out in the summer. Unfortunately, this can also result in indoor air pollution, dirty air continuously circulating inside your home. Mold, bacteria, gases, dust, and pollen are just some of the contaminants that can stay in the indoor air. This pollution can come from everyday items such as carpets, building material, paint, household cleaners, and bug sprays. Technicians at B&L Ott know how to improve indoor air quality through HVAC systems. We will be happy to speak with you to make knowledgeable recommendations based on your preferences and needs. If you are interested in learning more about your air cleaning options, please contact us with any question or to schedule service today.